The 2010 offseason has caused Grabowskies across Bears nation to choose sides. On one side are those hoping for aggressive offseason player acquisitions to get the Bears back in the playoff picture. The other side includes those rooting for the folks at Halas Hall to maintain the status quo in 2010 so we can say “sayonara” to Lovie and staff at the end of the season. 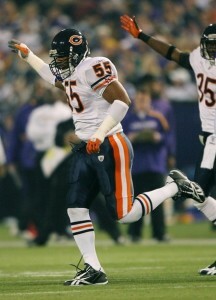 Trade 5-time Pro Bowl LB Lance Briggs. Hear me out on this one. Briggs is the only player, besides Cutler, that the Bears could trade straight up for a 1st round pick (and maybe a mid-rounder too). So if that pick turns into a talented young defensive end or play-making safety, I think we green-light this baby. And in Jamar Williams, we already have a big talent ready to step in and replace Briggs. He’s a restricted free agent and it wouldn’t cost the Bears a mint to extend him. Williams has proven himself in the playing time he’s had – remember the 20-tackle performance vs. the Rams? With a healthy Urlacher in the middle, Pisa or Roach on the strongside, and speedy Williams roving the weakside, the Bears would still have a formidable LB corps. And let’s face it – in Lovie’s Cover 2 scheme, an outside LB is probably the 5th most important position on the field after a pass-rushing D-end, cover-capable middle LB, ball-hawking safety and disruptive D-tackle…and you could argue we don’t currently have any of those on the roster now. But a Briggs trade could deliver one over the short and long-term. There’s no doubt parting with Lance would be hard…especially for Urlacher, who would be thrust into an even larger leadership role (along with Alex Brown). And I understand the risk of trading a proven performer for a draft pick that may or may not materialize. Since leaving his Lamborghini abandoned on the side of a Chi-town expressway in the middle of the night in 2007, Briggs has been one of the most outspoken, stand-up players on the squad. But in this win or get canned year for Lovie and staff, I think the Bears have to shake things up rather than settle for more of the same thing. Why bother trading Lance when we should be able to move Urlacher for potentially a second, maybe with a 3rd or 4th as well. Urlacher is much older, and either Jamar or Lance should be able to shift middle if required so in a 3-4. The linebackers were a highlight for the Bears last year (without Urlacher), and some question if Hunter could be more consistent than injury plagued Brian. We could swing Brian to a team such as the Giants for their (potentially) new cover 2 under Fewell. If Jerry was really bold, he would include Olsen as well, and get Umenyiora or Steve Smith back with a draft pick. Hester could be traded elsewhere as well because his kick returning duties have been masterfully replaced with Knox and Manning, and he isnt that good of a receiver (but carries a huge contract). I believe Johnny could easily take his spot in the line up, especially if we were to get an elite lineman, safety, or even receiver back. Various fields of life utilize a lot of efforts, hence why should we expend free time for definition essay creating? That is bright to utilize really professional custom sociology essays service to purchase the research essay from, I guess. some interesting points here, in the post, as well as the comments. true, Jamar Williams appears ready to step up big time. I however would only move Urlacher to Free Safety, not to another team. Devin Hester… although the point is valid that he is not a great (1) receiver, you do have to admit that he is serviceable at the very least; I doubt the Bears trade him this off-season without getting a look at him in the slot in Martz’s offense. BTW, Amelia21qk, you are a spam-whore. arious fields of life utilize a lot of efforts, hence why should we expend free time for definition essay creating? Contemplating trading Lance Briggs is absolutely ridiculous. I was going to rationalize the obvious reasons to keep but, what’s the point? We cannot lose the only healthy, consistent, steadfast and talented defenseman on the team for the possibility of getting a 1st round potential defenseman that might be good in a year or two. You don’t trade star players in good standing with the organization for draft picks. Sometimes I think Angelo couldn’t be any worse of a GM, then I read ridiculous suggestions like this. Wow,that would be stupid trade your best linebacker for an unproven draft pick,when you can go out and buy a free agent safety an offensive lineman and whatever the team needs.I say keep Briggs keep Urhlacker build on what you have so you dont create any new holes going into this season……..